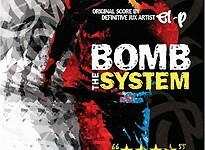 "Bomb the System" is the first feature in over 20 years to delve into the world of graffiti art. The film, shot entirely on the streets of New York City, is the feature debut of 23-year-old writer/director Adam Bhala Lough. Mark Webber ("People I Know," "Storytelling," "The Laramie Project") leads a talented young ensemble cast as Blest, a 19-year-old graffiti writer fresh out of high school with no ambition for the future. New York City is Blest's playground. He spends his days stealing spray paint from local hardware stores - and his nights getting high and "bombing" the streets with his graffiti crew. He is the most wanted writer on the NYPD Vandal Squad's hit list, and at the same time, is attracting attention from the local gallery scene. But things quickly turn ugly when 15-year-old Lune, the youngest member of Blest's crew, is arrested and brutalized by the NYPD. The crew retaliates by waging an all out "graffiti war" against the city: a war that ends up costing more than one life in the end. "Bomb the System" is a true New York story - a cinematic poem dedicated to the art of graffiti, and to the city where it all began more than two decades ago.